My wife, Tammie, loves to decorate our house for Halloween. For our back room, I did this 36″ x 36″ acrylic painting as a gift for her. It felt good to work with traditional brushes after working pretty much only with painting knives the past couple years. It’s the best way to work for me when I want to get more detailed. 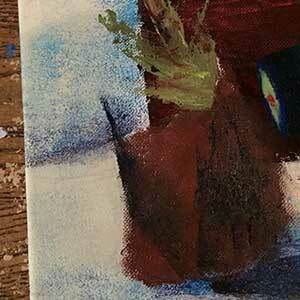 At the same time, all that knife painting seems to have loosened my brushwork up. Anyway, here’s the finished painting. I had a lot of fun doing it, especially the skull in the full moon. The 2 cats are our cats, Neko and Athena. 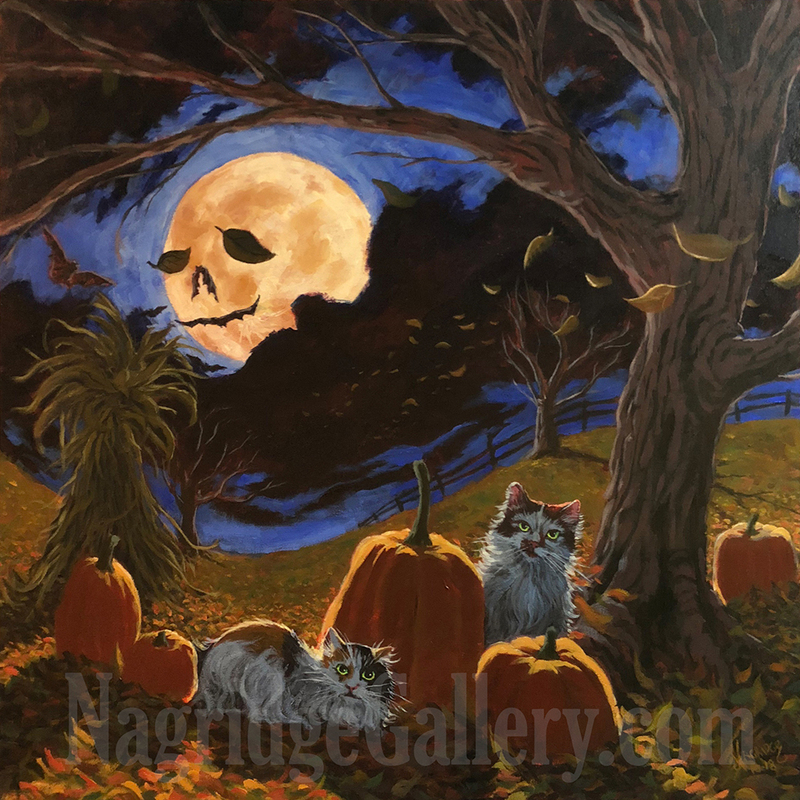 I titled it “It’s Halloween!” and, yes, I did get that title from the song by The Shaggs. I’ve also made a YouTube video slideshow of the painting in its progressive stages, which you can watch below. I know it’s early, but Happy Halloween! The temperatures this week have been very low. I attempted a plein air yesterday and had to quit after a half hour. Today, I’m playing it smart and doing a painting indoors. I took this photo of my backyard and saw all kinds of possibilities for a painting. 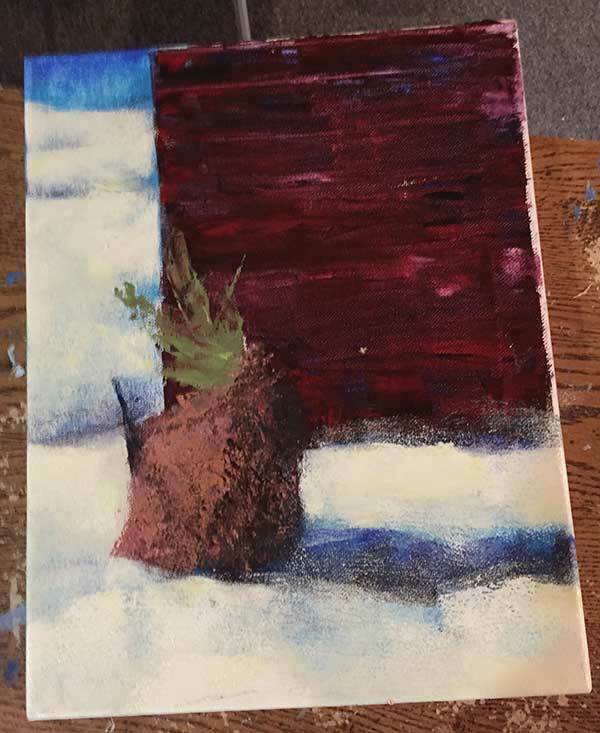 An evergreen wrapped in burlap, shadows on the snow, a tree with berries that has snow covering the branches — lots of different subjects to choose from to make a good painting. Like plein air, the secret to a good painting isn’t just what you put into it from what you’re viewing, but also leaving out some of the things you see before you. I decided to concentrate on the small evergreen wrapped in burlap with my neighbor’s garage in the background. 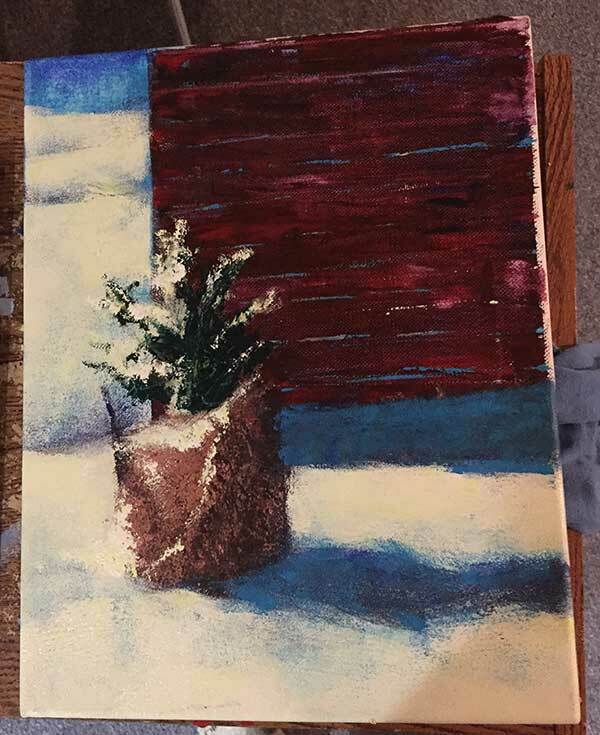 I may be teaching a class in acrylic painting this winter/spring, so I thought I’d do a quick acrylic painting without the use of traditional brushes or painting knives. 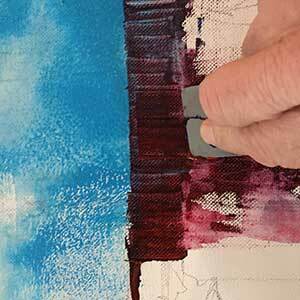 Acrylic is a very versatile medium that plays well with many fun tools. A lot of these tools can be found at a dollar store. 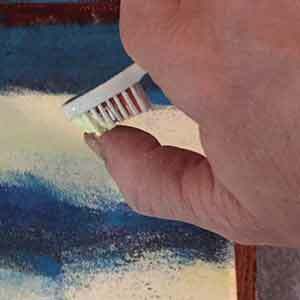 A lot of items you may already have in your household could be used in a creation of an acrylic painting. It’s a medium that encourages one to be experimental with tools and execution. I ventured around the house and found things like plastic canvas keys, small foam paint rollers, rags, an old toothbrush, sponges, and paper towel. I set up a palette with a few acrylic paint colors. I got a small children’s beach bucket that I used to use when I painted regularly with acrylic, and filled it halfway with water. I also got my spray bottle and filled it with water. A spray on my palette every so often helps keep the paints from drying out. 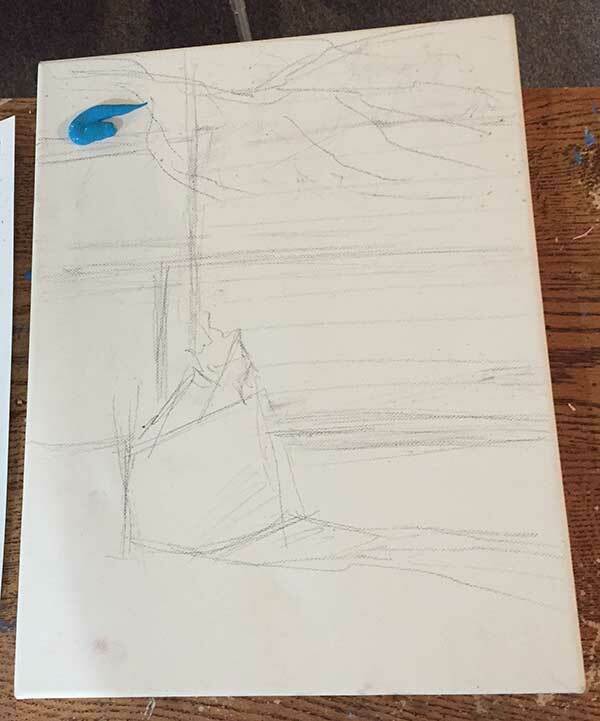 I found an 11′ x 14″ canvas and did a quick drawing with a basic number 2 pencil. I didn’t want to use a traditional art pencil. I wanted to make sure that the only traditional art materials used were the palette, the paints, and the canvas. If I wanted to be complete non-traditional, I could probably have used a piece of cardboard for a palette and all kinds of surfaces instead of a canvas. Acrylic will stick to almost anything. The drawing on my canvas has a lot more elements than I ended up with in the final painting. 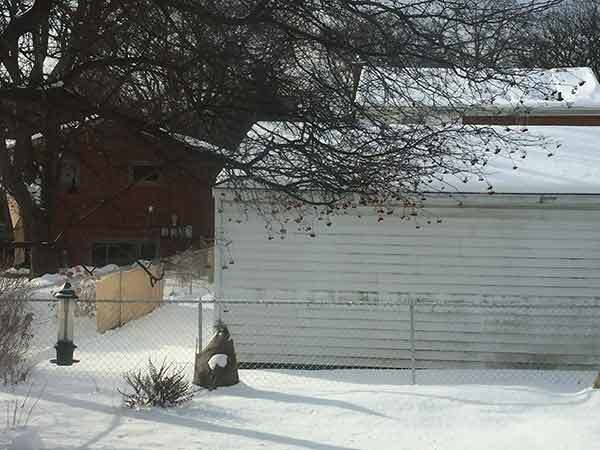 I included the fence, as well as the tree with the berries on top. At the end, I simplified the composition greatly. I thought I’d start with the snow. I applied some liquid blue acrylic paint directly to the canvas. 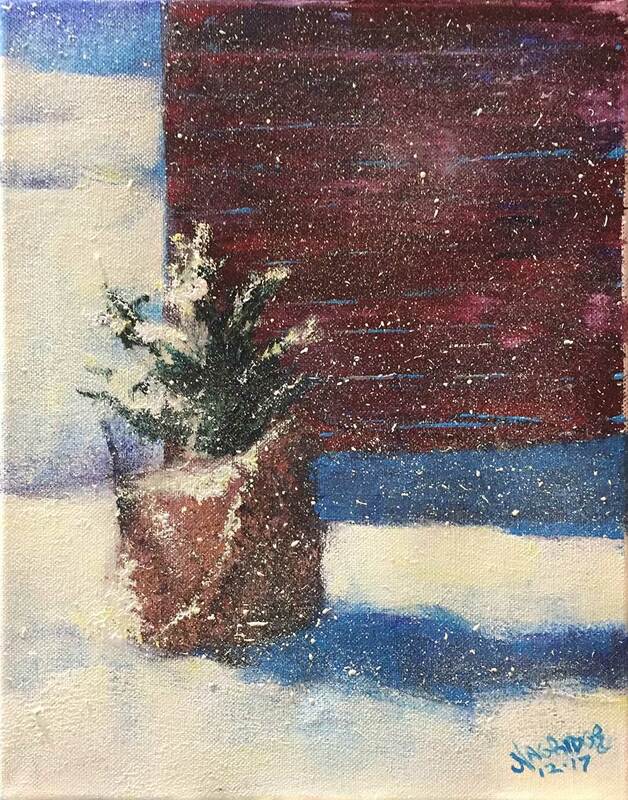 Then I got one of my small paint rollers and applied the blue paint all over the areas of the canvas that had snow on the ground. 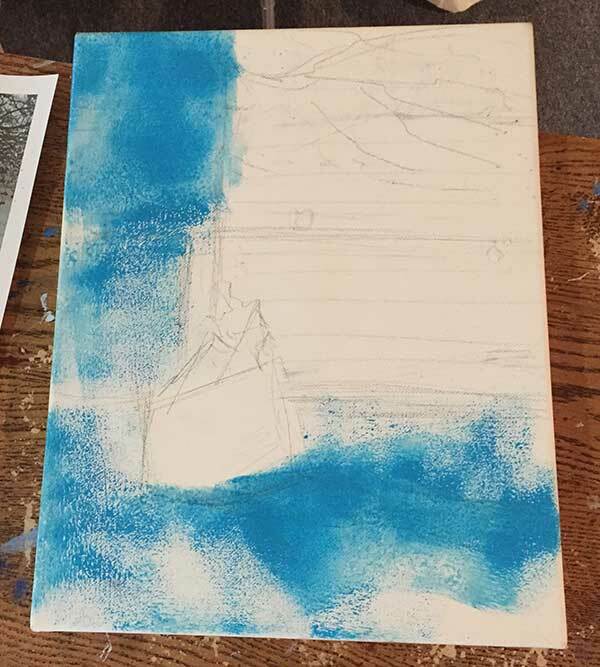 I didn’t try to be too careful with the blue because I knew I would be painting on top of it later on after it dried. 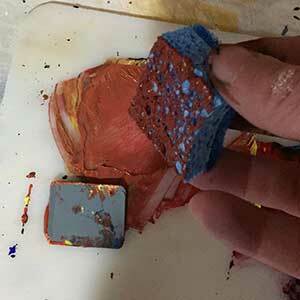 I made a mix of ultramarine blue and crimson using a plastic canvas wedge. I didn’t mix them too thoroughly. In fact, I picked up some blue on one side of the wedge and red on the other. I then dragged the purplish mix all over the areas of the side of the garage. My intention was that the white garage would be in shadow, so I’d start with a dark cool color and then go over it with a lighter version. As it turned out, I liked the color that was applied and left it as is. 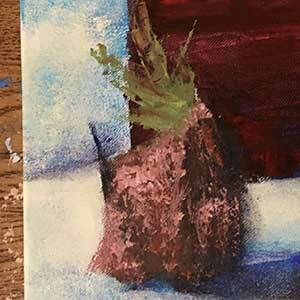 I applied some of the purplish mix as a shadow color for the wrapped evergreen, as well. It looked too dark, but I knew I would be going over it later. The purple provided a nice base. 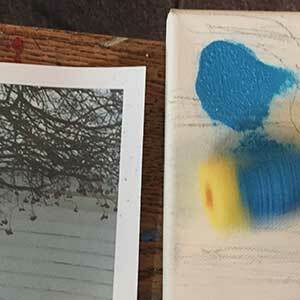 I then took the same roller I used for the light blue and picked up some ultramarine blue from the palette. 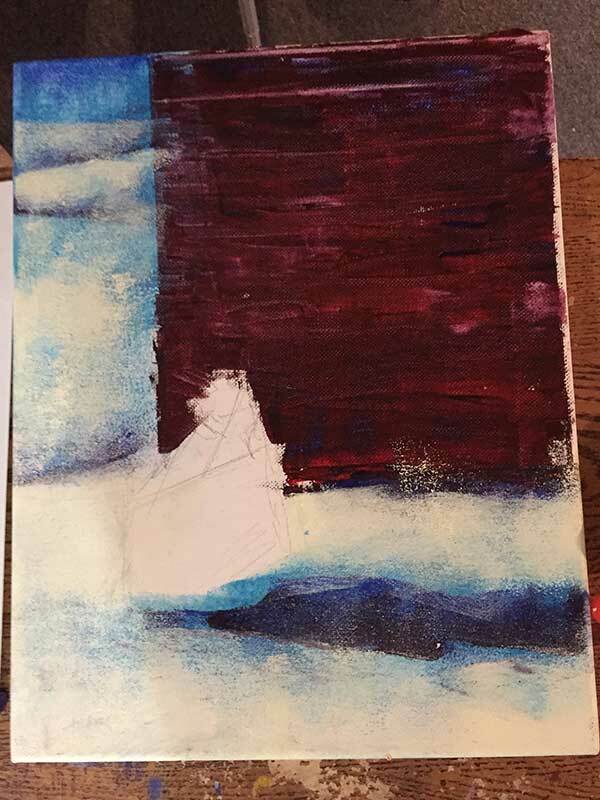 I took the roller and applied this darker blue to the top of the sky and to the bottoms of the snow hills. When it dried, I got a clean roller and made a mix of titanium white with just a little touch of yellow. With the roller, I applied it to all the snows areas that were not in shadow. With the little paint left on the roller, I added a light coating of it in the shadow areas, as well to remove their harshness. Add you can see some got onto the left side of the garage. When it fired, I use the plastic canvas wedge to apply and scrape more of the purplish mix to the areas I didn’t want the white coating on. That’s the great thing about acrylic paint. It’s easy to correct quickly. 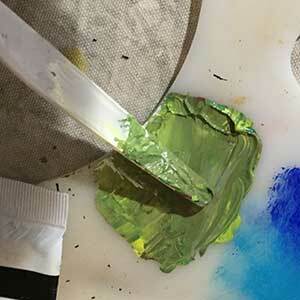 With a plastic knife I found, I mixed a green from the yellow and ultramarine. I added a little red to darken it. 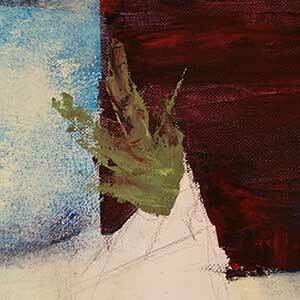 Using the same knife, I applied the paint to the canvas to indicate the evergreen sticking out from the burlap wrap. 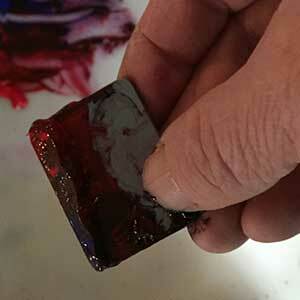 I made a brown from the yellow, crimson, and ultramarine blue and picked some up with a rag wrapped around my finger. 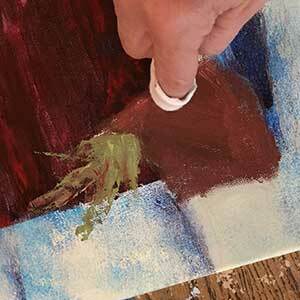 Using my finger in the rag, I rubbed the paint into the areas of the burlap wrap. 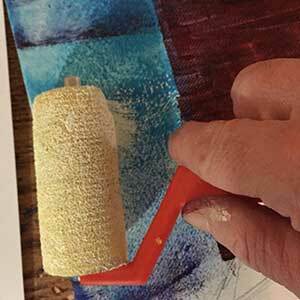 When it dried, I took the roller with the blue paint and picked up some more ultramarine to the roller’s edge. I applied it to the burlap to color the shadow area. I also tilted the roller to the edge and applied it to the left edge of the burlap to indicate the stake sticking out the burlap. I wanted to suggest the rough texture of the burlap, so, I made a mix of a lighter bown by adding some titanium white to the original brown mix. Using scissors, I cut a piece of sponge. I applied the lighter brown mix to the burlap. I was hoping the sponge would give a texture to simulate the burlap. Unfortunately, that didn’t work as planned. The paint was applied too solid and it didn’t look warm enough. I let it dry and made an even lighter mix, except I added some yellow to it to warm the color up. This time, I used a dry paper towel to pick up some of the paint. 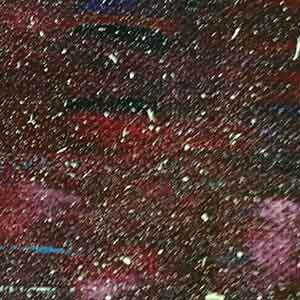 I was more successful getting a texture with the paper towel, as long as I didn’t have too much paint on it. The areas with the snow were still too dark. I made more of the titanium white and yellow mix. I used the same second roller as before with that paint mix and applied to the tops of the snow, as well as over the snow shadows to soften them. The painting really brightened up with the added contrast. I thought the free looked too bright. Also, the garage itself still looked too flat. The green was an easy fix. 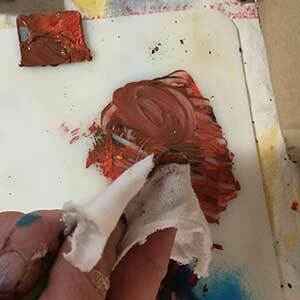 I squeezed some Pthalo green onto my palette and darkened it with the crimson. I applied it with the plastic knife on top of the brighter green areas. Now it looked more like our evergreen! Time to work on the garage. I poured out some more of the liquid bright blue onto my palette. I cleaned my knife off and drew the edge of it into the pile of blue. I then pulled the knife along the garage to make horizontal lines to indicate snow that got into the grooves of the siding. 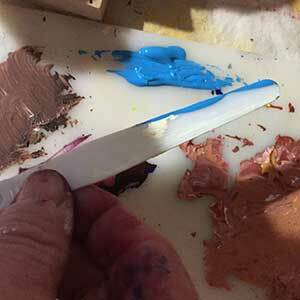 When the paint stopped coming off the knife, I’d wipe it and draw it through the paint on the palette again. Sometimes, instead of drawing the blade onto the painting, I’d just tap the edge onto the canvas to get a different type of line. I wiped the knife off and used it to pick up some of the white/yellow mix. I applied it a little thickly onto the evergreen and to the burlap. 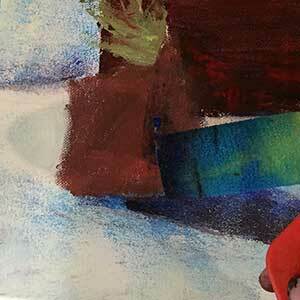 The painting’s almost done, but I decided to make it a really snowy day. 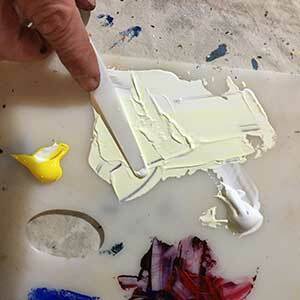 I made a thinner mix of the titanium white and yellow. I mixed it together with a toothbrush. 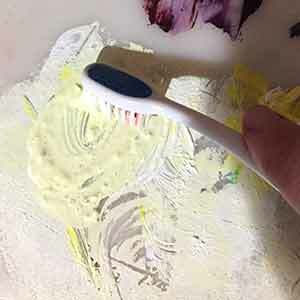 With the toothbrush bristles loaded with paint, I flicked it over the canvas to get a nice uneven spray. I applied it to the entire canvas. Here’s the final painting, completely in about an hour or so. 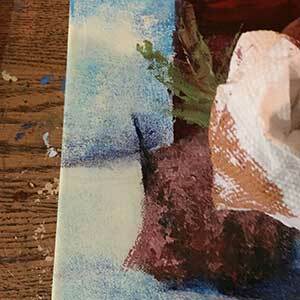 Acrylic dries so fast, I was able to cover up areas within a couple minutes with each step. 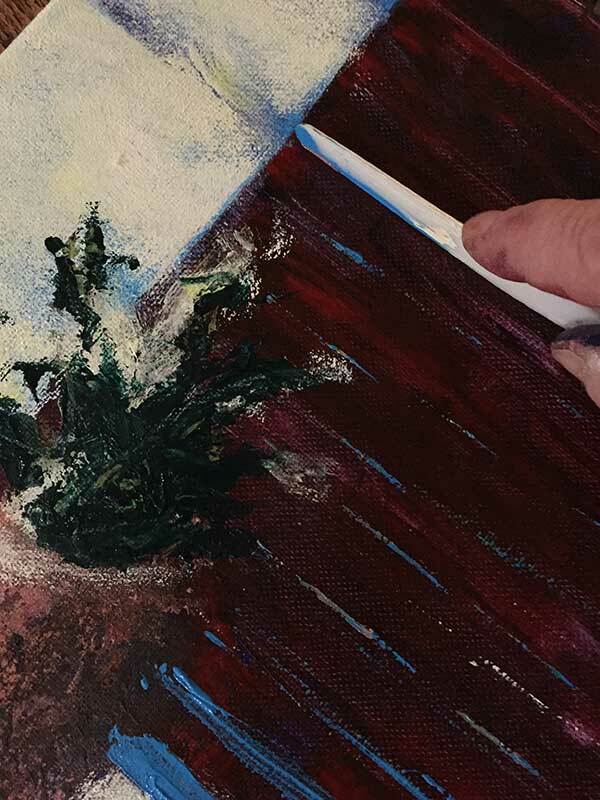 And the only time I picked up a traditional tool was when I used a small brush to sign the painting. This was an exercise in fun. 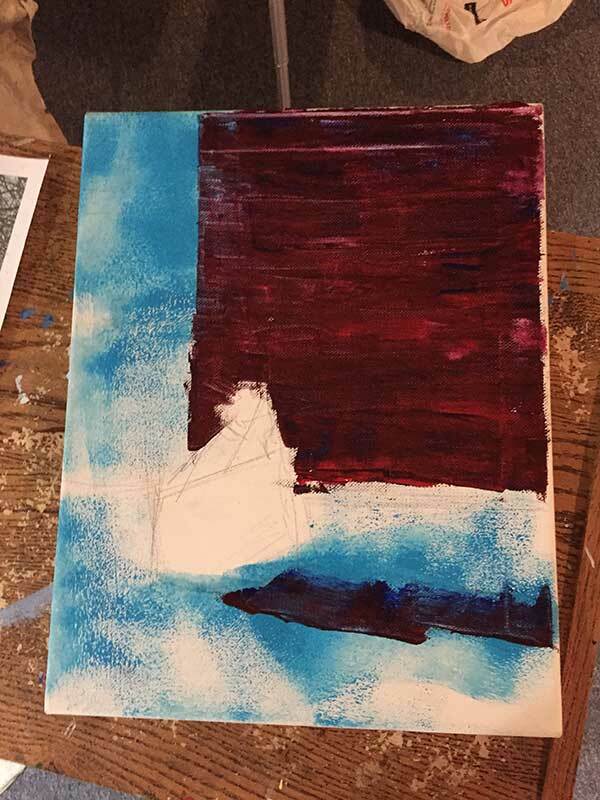 I don’t work in acrylic enough and hopefully I will experiment with this versatile medium again soon.